If you follow me over on Instagram, then you know I’m a daily consumer of smoothies and smoothie bowls. So imagine my surprise when I looked at my posting history from the past several months and realized that I hadn’t shared a smoothie/smoothie bowl recipe here since this Apple Pie Smoothie Bowl during first week of October. Shocking, right? 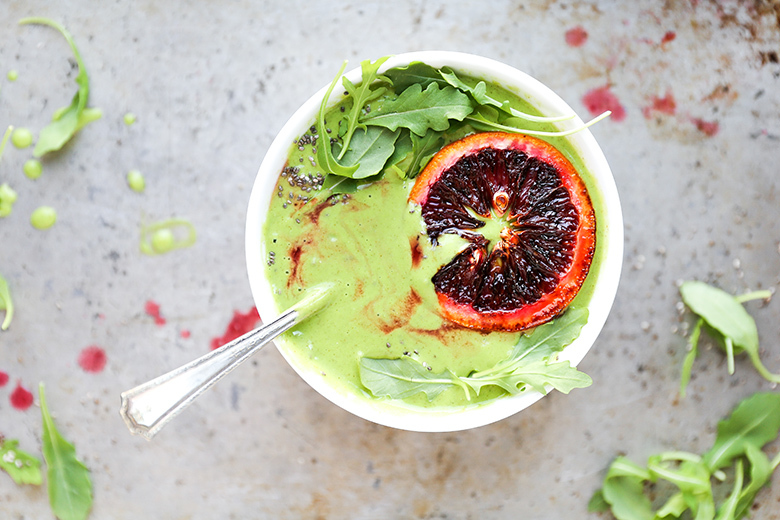 So I’m here today with this Orange and Arugula Smoothie Bowl to appease the food blogging Gods. Now, I certainly never want to discourage someone from making one of my recipes, but I feel like I should be up front and say that if you’re a person who isn’t into savory smoothie bowls, this one might not be the best fit for you. 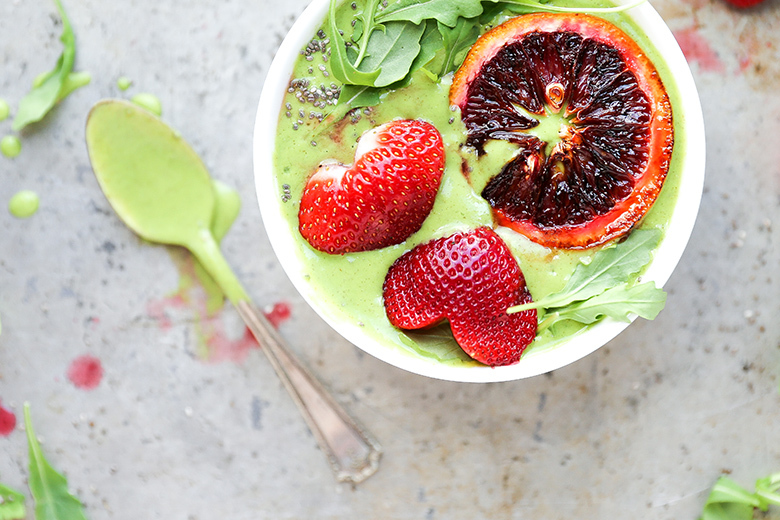 Because this smoothie bowl has got some kick! In this bowl you’ll find a hefty doze of arugula and that classic peppery taste that goes along with it. I’ve also added in some parsley and…wait for it…cauliflower! Yes, there is cauliflower in here! But let me tell you that you can’t taste it one bit. For real. I would not lie to you about this. Don’t fear the cauliflower! I got the idea about the cauliflower from a recipe created by Laura that was published on The Kitchn earlier this year. It’s a great way to add more vegetable fiber to your smoothies and smoothie bowls. Admittedly, sometimes my sweet tooth takes over and I tend to fall a little too far on the sweet side of things. It’s easy for my creations to turn into something more closely resembling a milkshake (not that I’ve ever complained about that!). So adding in a handful of cauliflower is a great way to bring the balance back to the vegetable side of things. And if you’re anything like me, you always have some pesky cauliflower florets (or stems that you’re going to toss anyway) in your crisper drawer that need using up. I’m still crushing hard on Winter citrus, so I’ve got a whole orange in this recipe. And for fun, I made a couple brûléed orange slices for decoration (and I practiced making some strawberry hearts for one of the photographs, since it’s almost Valentine’s Day and I’m a hopeless romantic!). You can use whatever kind of oranges you like, but I’m partial to blood oranges and Cara cara oranges right now, since they won’t be available as readily once Spring rolls around. To balance the savory ingredients, I used a super ripe banana and some vanilla-flavored yogurt. I didn’t want this smoothie bowl to be TOO savory. Even I have limits. 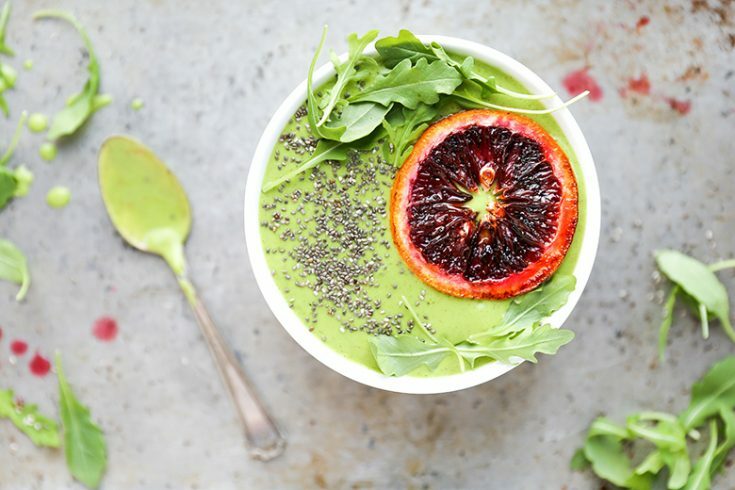 I’m sharing the recipe for this Orange and Arugula Smoothie Bowl as part of our monthly #eatseasonal recipe round-up organized by Becky from Vintage Mixer. If you’re finding yourself in a cooking rut this month (the internet is basically just a sea of red velvet desserts at this point), then check out Becky’s February Produce Guide for some inspiration. And don’t forget to see what new recipes some of my blogging friends have created this month, too. Just click the links below! To make the brûléed orange slice(s), sprinkle one side of the orange slice(s) with sugar. Heat a dry skillet over medium-high heat. Once the skillet is hot, add the orange slice(s) sugar-side down and cook until lightly caramelized, about 1-2 minutes. Remove the orange slice(s) from the skillet and place on a plate with the brûléed-side facing up. Set aside. To make the smoothie bowl, add all of the ingredients to your blender. Blend on high until smooth. Pour into a bowl. Top with a brûléed orange slice(s) and additional chia seeds, if desired. Enjoy immediately. I always add a veggie or two to my smoothies too but I’ve never tried cauliflower!! Love the idea! Such a great trick! Glad I discovered it. I bet broccoli would be good too, since it’s also pretty mild when raw. I all came together because my Mom gave me a HUGE bag of arugula and I just couldn’t eat it all in time. So into the blender it went. I was definitely afraid, but it was good! Now I’m adding arugula on the regular! Such a great trick, right? So glad I found that article and now I’m doing it all the time! #1) I’m a daily smoothie consumer too! #2) the color of this bowl is unreal! The perfect way to brighten up these long winter days! Thanks, Laura. I hope you try it out! Citrus is finding it’s way into everything for me lately — I can’t get enough! I would never have thought to add cauliflower to a smoothie, but it has such a mild flavor raw that I’d have to think it wouldn’t taste like anything? I love the green color and that bruleed orange slice is just gorgeous! Yup, the cauliflower is so mild that you can’t taste it at all. I’ve also read zucchini is another good veggie addition that will remain hidden, and I want to try that once it’s in season. Now THIS is a new idea. I always have cauliflower cores left over… *Mentally adjusts thinking* LOVE it! And good way to appease the food blogging gods. Right? Great way to clean out the crisper drawer. That’s how a lot of my smoothie recipe ideas are born, if I’m being completely honest. Lol. I hope you get the chance to try it out! Wow! smoothies yes, but smoothie bowls not in my kitchen repertoire. Gotta get there and this is the one–sold! Pinning! Really? You haven’t gotten on the smoothie bowl train yet? Wow! You better remedy that situation! They are so fun because of ALL THE TOPPINGS! I got really into smoothies when I was pregnant but for some crazy reason I haven’t made one in so long! They’re such a great way to pack tons of vegetables into your breakfast and I love that you used cauliflower in here! I’m going to have to try that for sure 🙂 I also haven’t enjoyed nearly enough winter citrus and I need to get on that! Oh yeah, you better hurry up with those blood oranges and meyer lemons. They won’t be around for much longer! I always knew you were a crazy lady, and here you’re just conforming that I’m right. Arugula! Seriously, amazing. Just look at these colors, so beautiful! Ha ha. Is that too crazy? I don’t know. I will admit that I was skeptical at first, but now I’m fully on board. You just have to make sure to balance it with some sweeter ingredients! Right? I’m always cleaning out my crisper drawer and finding bits and pieces of veggies that I can throw into my smoothies! Smoothie bowls are a standard at my house, but I’ve never made them with cauliflower before! Liz, you are a crazy genius! Wish I could say I thought of it, but I didn’t! I hope you try the cauliflower trick! 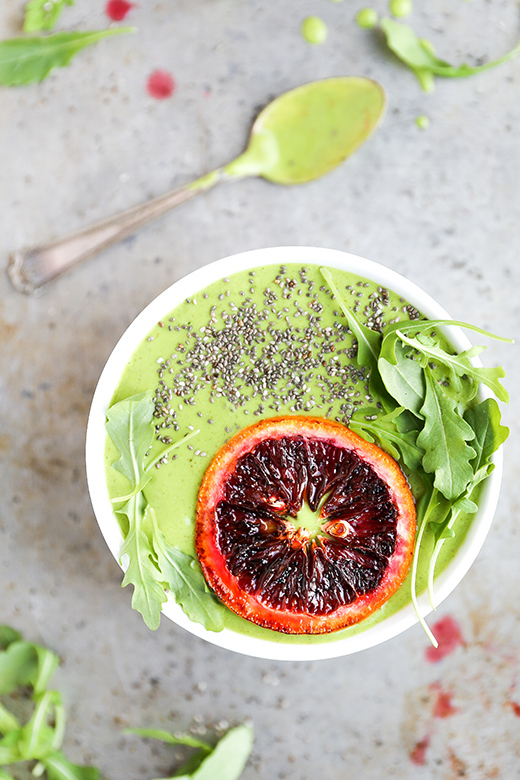 I’ve never put arugula in a smoothie bowl but now I’m wondering ‘why not’? Such beautiful photos! I hope you try it out, Charlotte!